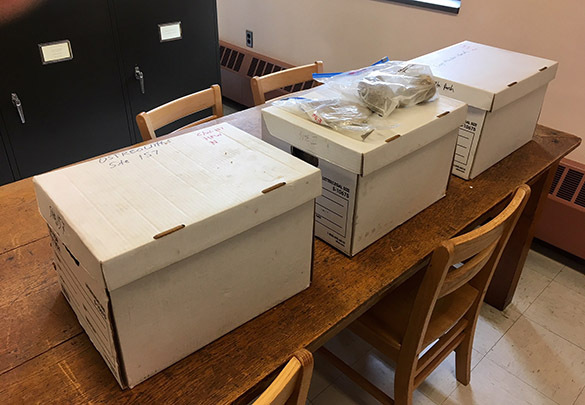 This summer, students through the AMRE program with funding from the Sherman Fairchild Foundation are working in the Wooster Tree Ring Lab doing historical dating. 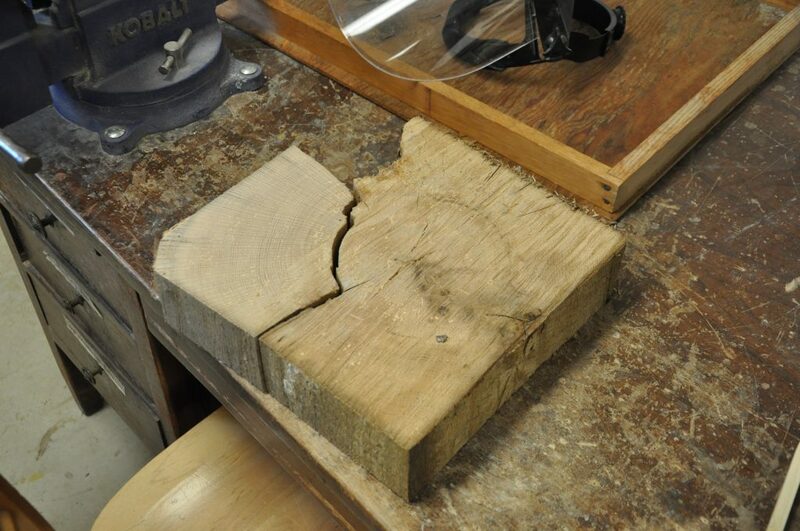 Kendra Devereux, Alexis Lanier, and Juwan Shabazz are working with clients to date local barns, cabins and houses, to update pre-existing tree-ring chronologies, and to examine the collected data as a record of past climate. Two additional students are also working in the lab with data collected from Columbia Glacier in Prince William Sound, Alaska. Josh Charlton and Victoria Race, who are funded by NSF (National Science Foundation), will be helping out the AMRE students, but primarily will be developing ice flow models and using tree rings to reconstruct mass balance for Columbia Glacier in Prince William Sound, Alaska. 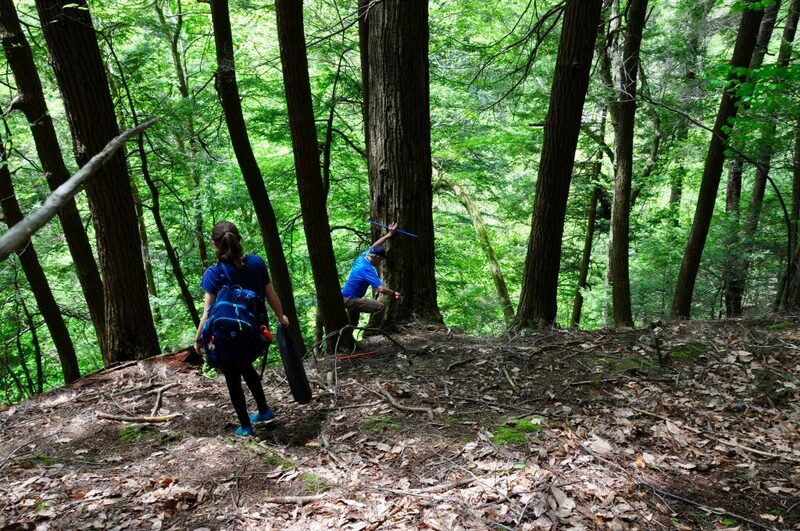 Summer researchers at Stebbins Gulch in the Holden Arboretum. 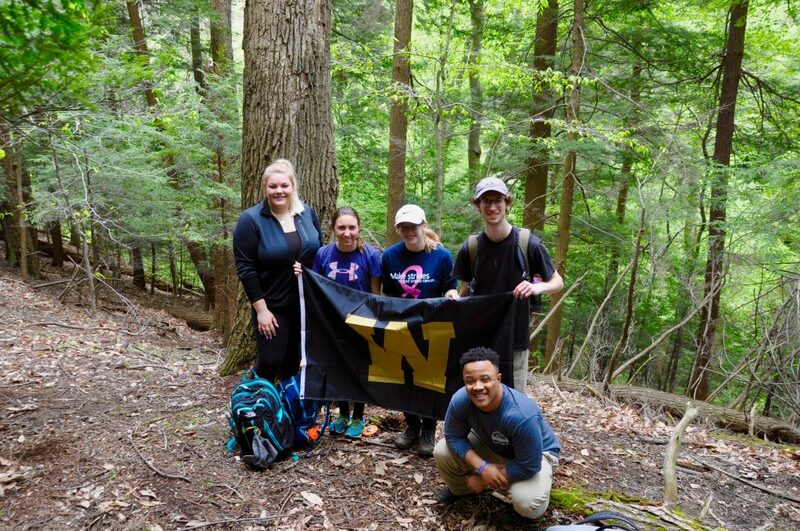 Pictured left to right: Victoria Race (’19), Kendra Devereux (’21), Alexis Lanier (’20), Josh Charlton (’19), and Juwan Shabazz (’19). The group has worked on a few different projects thus far. 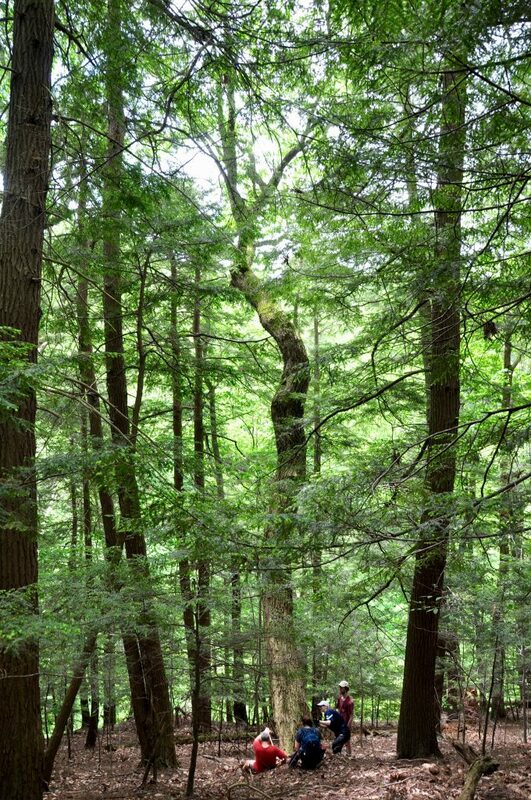 Their first assignment was to update the chronology for the Holden Arboretum in Kirtland, Ohio. The group has gone to the field site twice now to collect core samples from living Chestnut Oak trees in Stebbins Gulch. 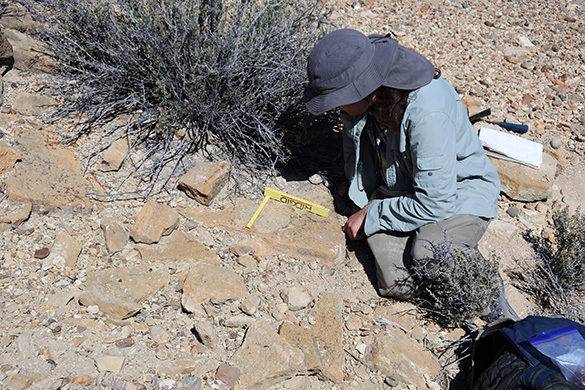 The AMRE group is currently working on mounting the fresh cores from our second trip and will be gathering and analyzing this data in the coming weeks. Sampling chestnut oak trees at Stebbins Gulch. 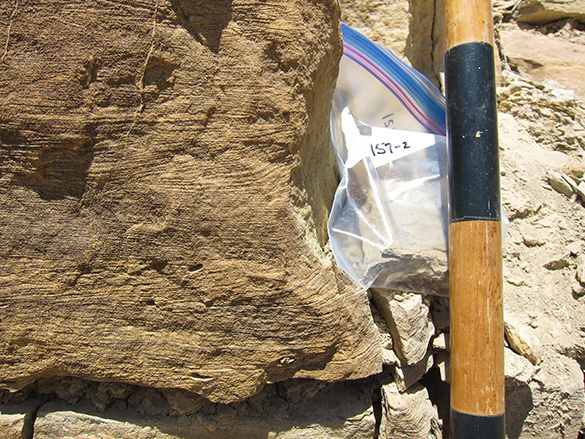 Freshly extracted core at Stebbins Gulch. 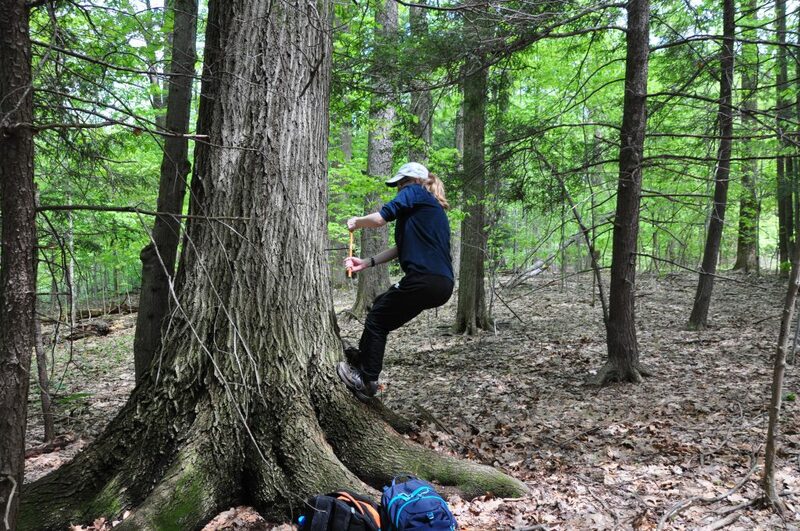 Alexis Lanier removing increment borer from a sampled tree. 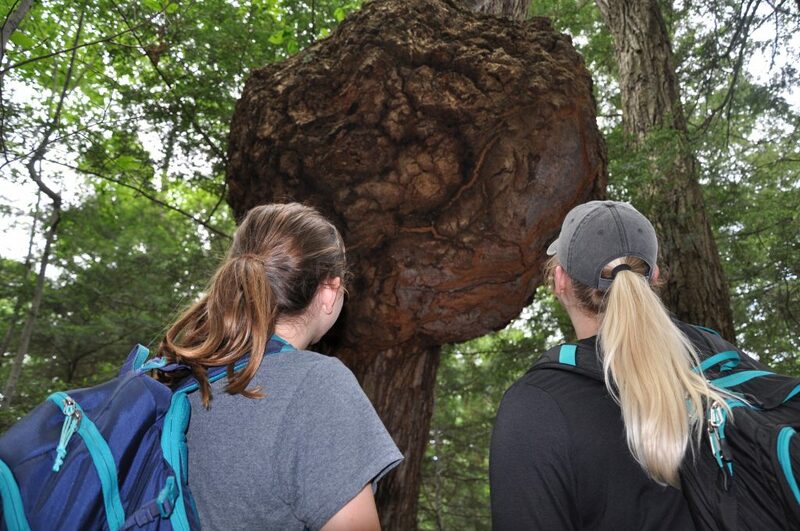 Kendra and Victoria looking at a giant burl on a sampled chestnut oak. Chestnut oak tree being sampled at Stebbins Gulch. The AMRE group has also worked with clients to date two local structures, Stratford Cabin and Gingery Barn. 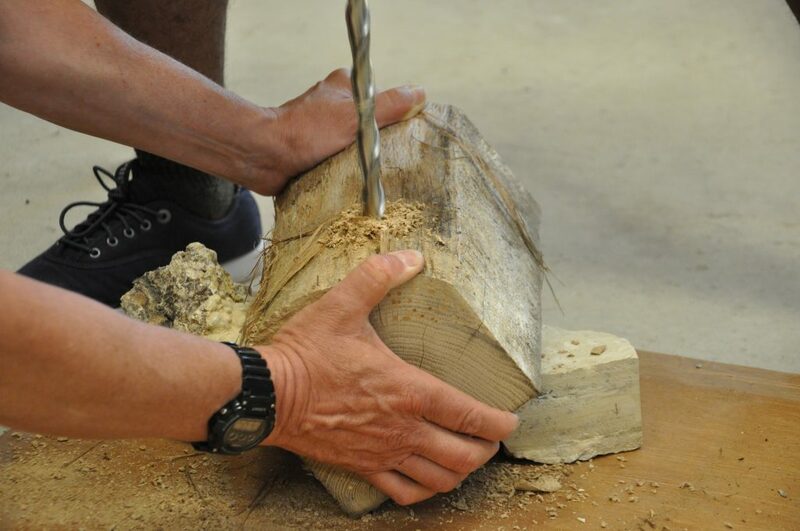 The group was able to date both samples and provide a calendar date for our clients, informing them when the trees used for building these structures were felled. Stratford cabin was dated to 1849 and Gingery Barn was dated at 1883. 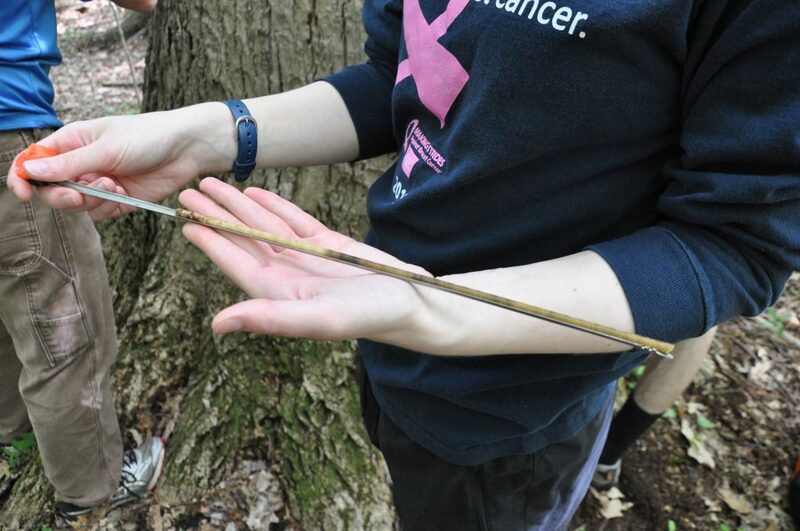 To provide these dates, the students counted and measured the tree rings. This data was then compared to other developed chronologies, a process called cross-dating, which allows us to assign a calendar date to these rings. 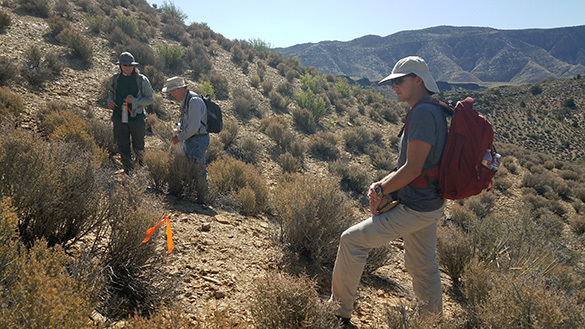 In the coming weeks, the group will be finishing up the work on Stebbins Gulch, dating some more historical structures from Sonnenberg Village, and compiling Columbia Glacier data. Further information on these projects can be found on the Tree Ring Lab’s website. Juwan drilling into a beam sample to extract a core from Gingery Barn. Oak slice ready for sanding from Gingery Barn. 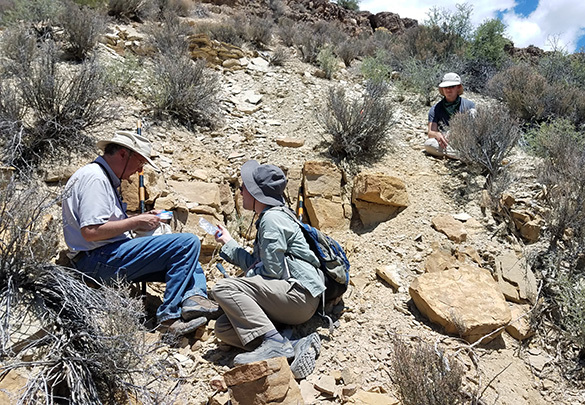 This month, our geological technician Nick Wiesenberg and I had the privilege of taking two Wooster Independent Study students into southwestern Utah to do research on the Carmel Formation (Middle Jurassic). The students were Ethan Killian (’19) on the left and Galen Schwartzberg (’19) on the right. (You’ll get better view of them in the links below where we have blog entries for each day.) I plotted out the localities during a solo expedition last month. 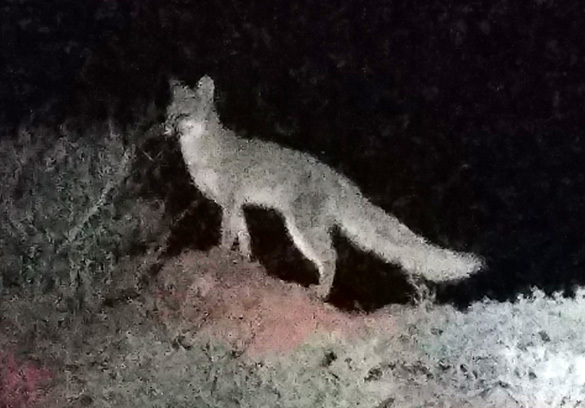 We hope we are re-establishing a field area for several more years of work. 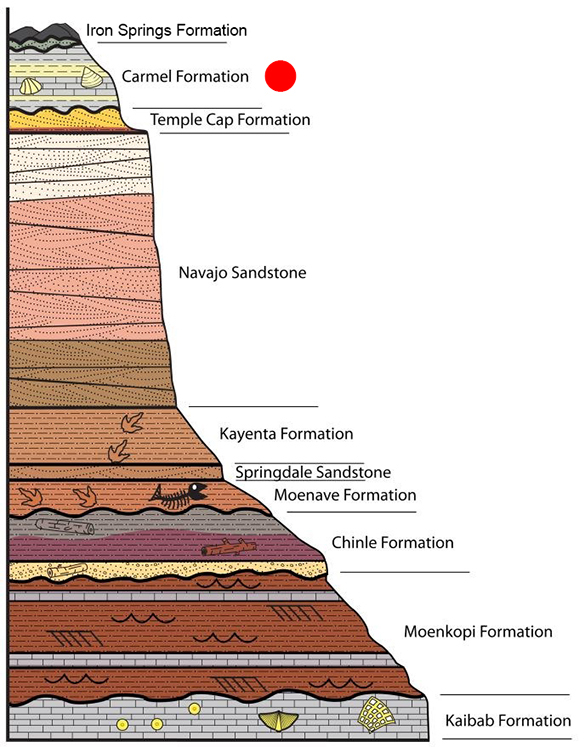 This is the local stratigraphic column (modified from that on the Zion National Park website). 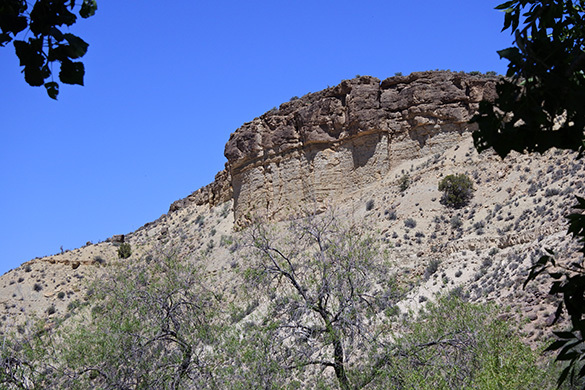 The area is dominated by the majestic Navajo Sandstone, with our Carmel Formation one of the very few carbonate units. Our main study areas. 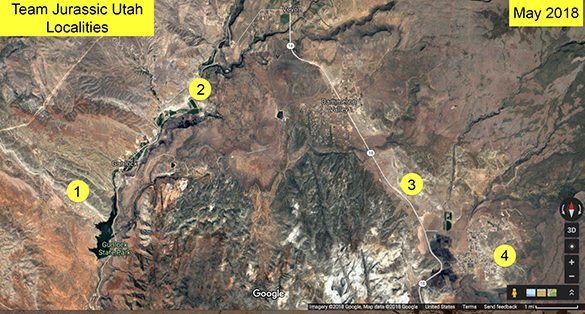 1 = Gunlock region; 2 = Eagle Mountain Ranch; 3 = Dammeron Valley; and 4 = Diamond Valley (“Water Tank”). 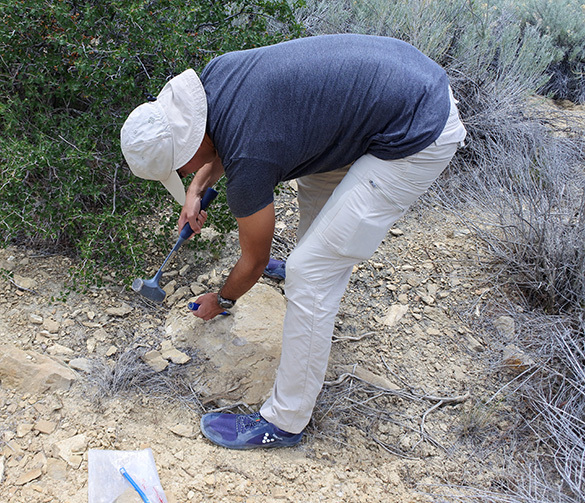 Update: Nick heroically drove our samples back to our Wooster paleontology lab. What treasures there are in these three boxes! 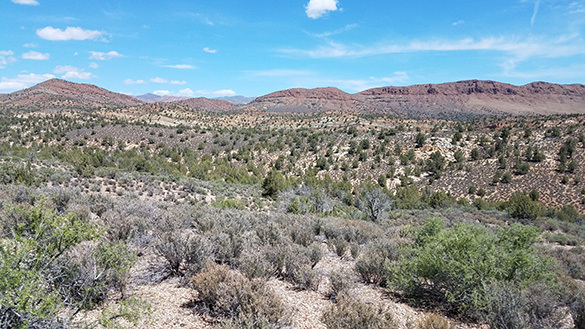 Santa Clara, Utah — We spent our last full day in this beautiful state enjoying nature, visiting local historical sites, and ending with a fantastic museum. 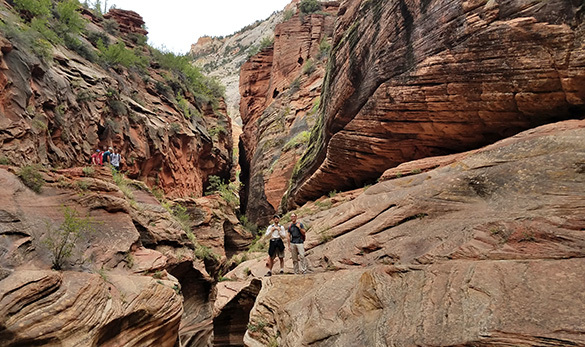 This morning began with a short journey through Snow Canyon State Park, which is just up the road from Santa Clara. This is a miniature Zion with the same Navajo sandstone, mostly white at the top and red below. The morning light was perfect. Note Nick on the rocks above! 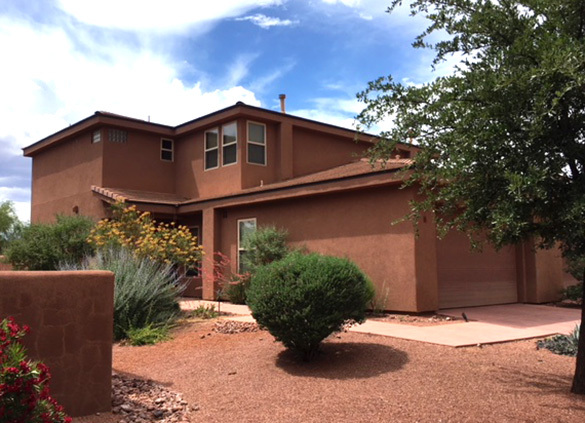 Here is an example of the lower red rocks. 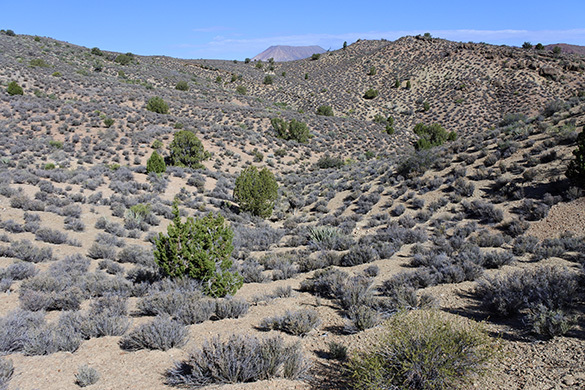 The foresets on these Jurassic dunes are easy to pick out. 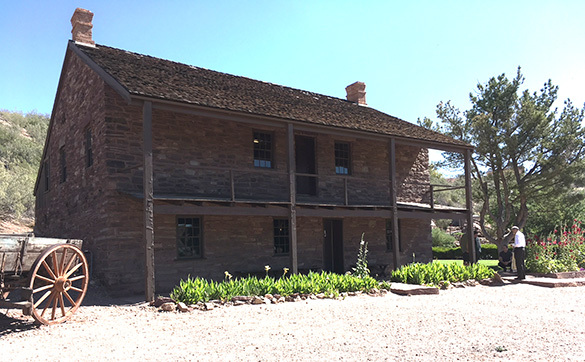 After Snow Canyon we toured the Jacob Hamblin Home in Santa Clara. This house, built in 1862-3, is the oldest surviving structure in Santa Clara. Jacob Hamblin (1819-1886) was a Mormon pioneer with a complicated history but generally known as an honest broker of frontier disputes. 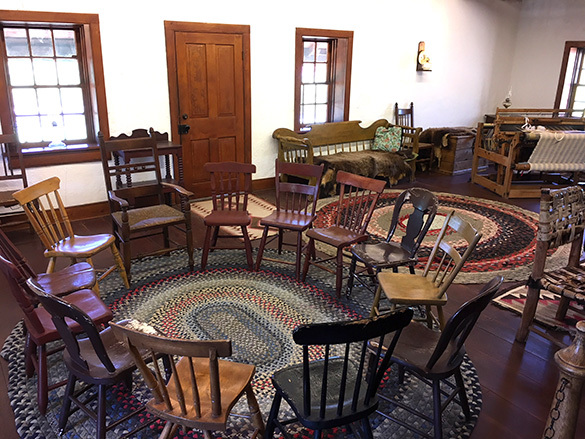 The second floor of the home is a surprisingly large space used as a bedroom for the 11 children and as a community gathering place. 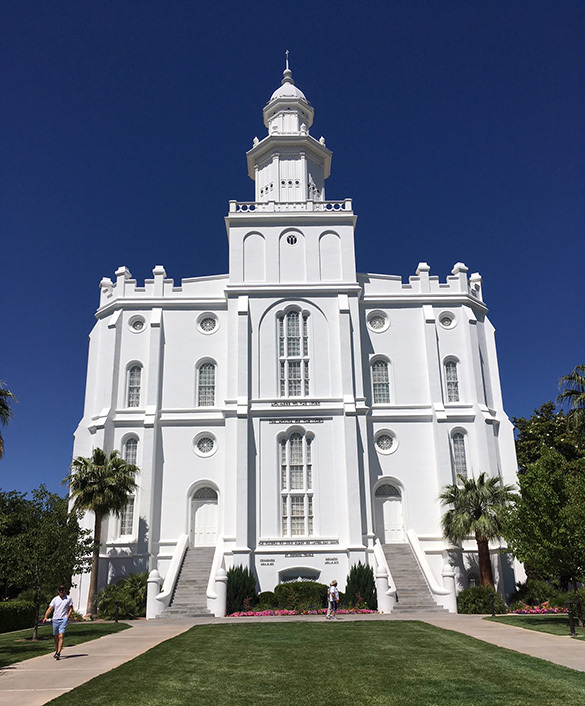 Our final cultural visit was to the St. George Utah Temple of the Latter-day Saints (the Mormons). It is an exquisite structure amidst carefully groomed gardens. 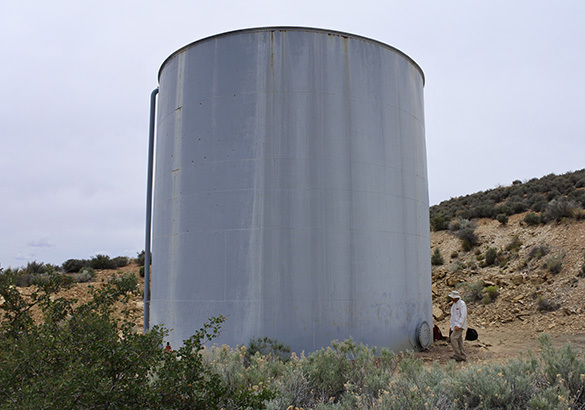 We went to the Visitor Center and received a very thorough account of its construction. 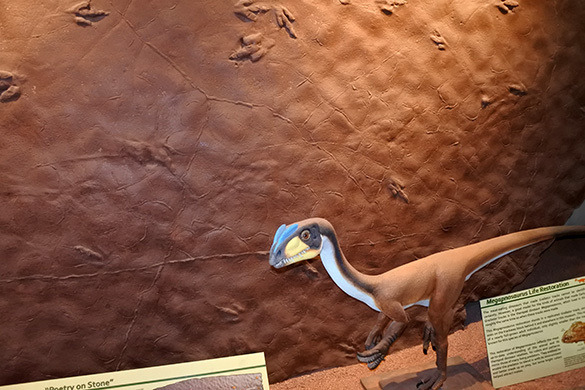 Our very last event was suitably paleontological and Jurassic: The Dinosaur Discovery Site at Johnson Farm. 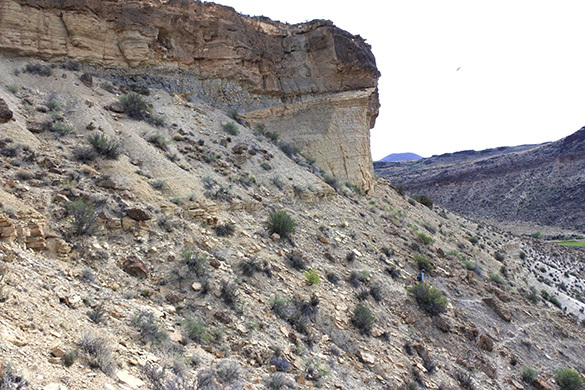 This building is constructed over an in situ set of dinosaur trackways in the Moenave Formation (Lower Jurassic). The tracks are amazingly well preserved and numerous. 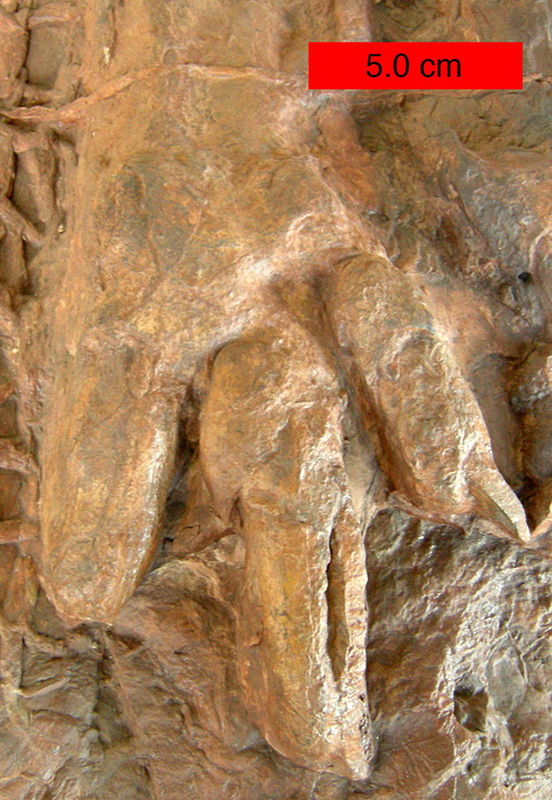 Above is the dinosaur trace Eubrontes. 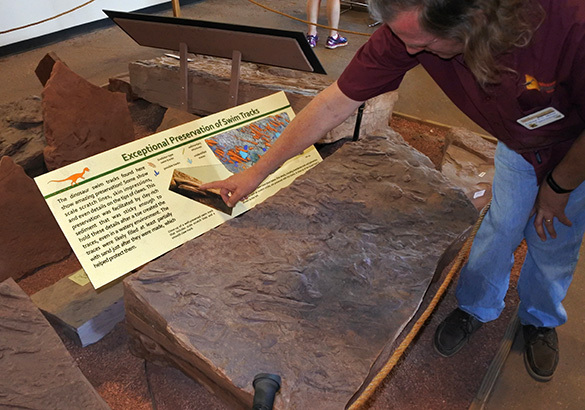 Our friend Andrew Milner, Site Paleontologist and Curator, gave us a guided tour, pointing out the extraordinary amount of biological information that can be deduced from trackways. 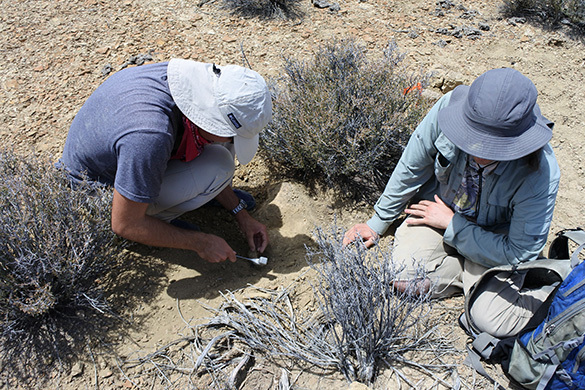 It is with this wonderful plunge into the world of Early Jurassic terrestrial fauna that our expedition ended. Tomorrow we fly from Las Vegas back to our homes, with Nick driving our precious samples to Wooster. We had a great time. Stay tuned for the laboratory analyses! 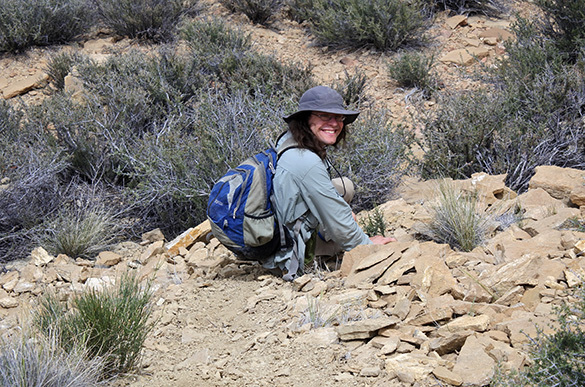 Santa Clara, Utah — When you want to sort out how something grows but can’t actually watch it do it, you look for examples of individuals in various developmental states. You can learn a lot about human growth, for example, by studying a group of people from infants to seniors. 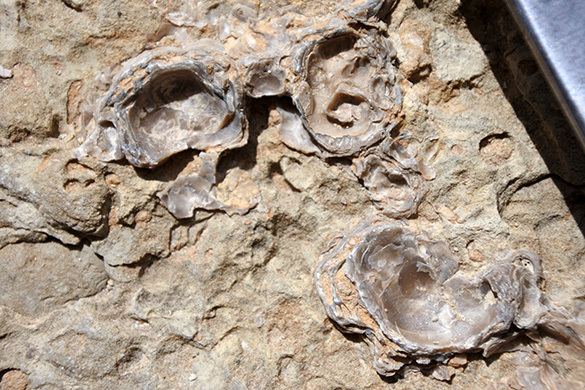 We do the same with Jurassic oyster balls: find a diverse population and sort out the relative ages. 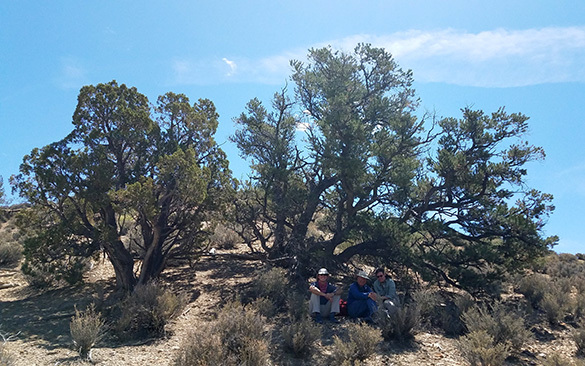 Today we revisited a site in the Gunlock area which in the 1990s yielded some “baby” oyster balls, thus gaining the name “The Nursery” (C/W-156). 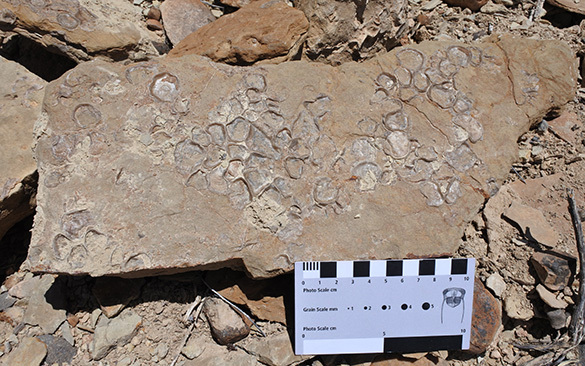 On its last day of fieldwork, Team Jurassic Utah (specifically Ethan) found the wonderful array of young oyster balls shown above, from least-developed on the right to most-developed on the left. These will be most useful in our lab analyses this fall. 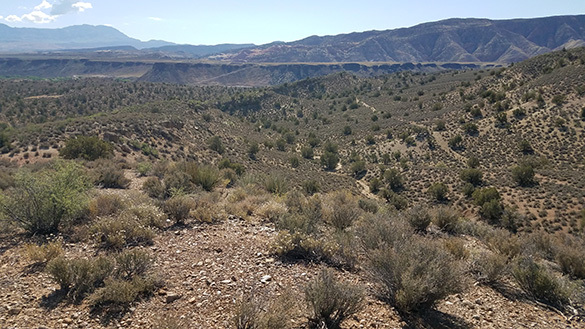 Here is our last field view of the Gunlock outcrops, mostly the Double Layer (DL) locality. One of our landmarks, Square Top Mountain, rises in the background. 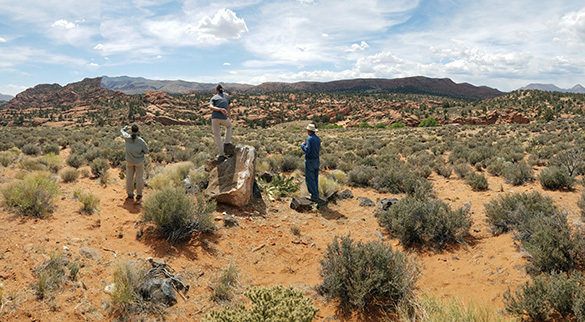 And the last image of Team Jurassic Utah at work. Thanks, Nick. 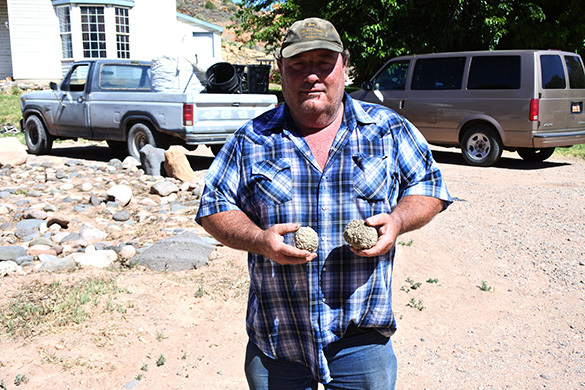 As we passed through the village of Gunlock, we gave Jay Leavitt two nearly-spherical oyster balls as gifts for him and Judy. 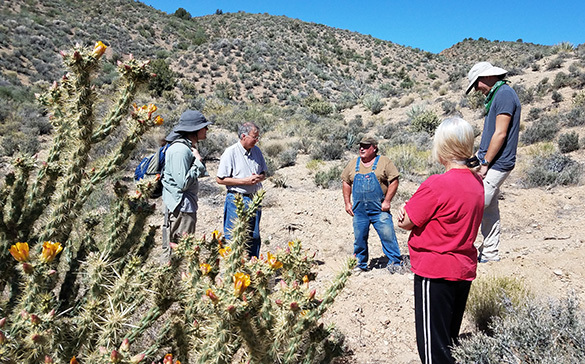 They were essential to us for access to private lands, and we had great conversations. The equally generous Hyrum and Gail Smith also received oyster ball presents. I hope they realize what treasures these are. Jay looks a bit dubious! 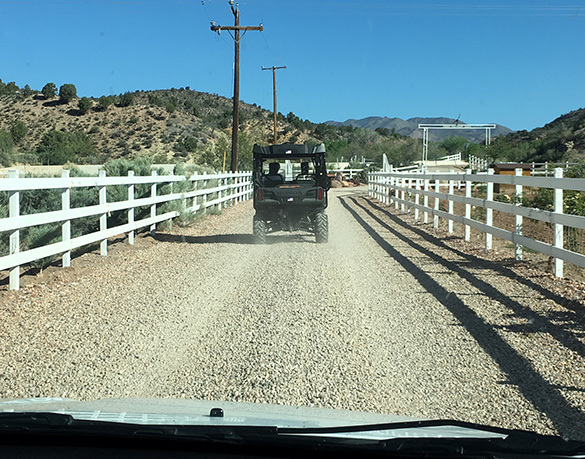 While in Gunlock we had permission to visit the backyard of a well-known collector, now deceased, who had a pile of oyster balls. 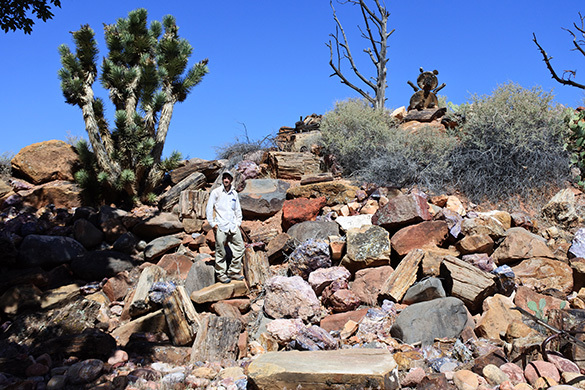 Turned out the astounding petrified wood collection dwarfed any we had ever seen! 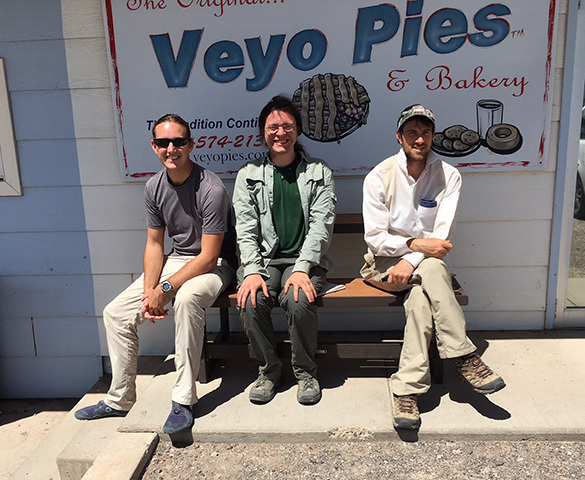 We had lunch at the famous bakery in tiny Veyo that produces delicious pies. 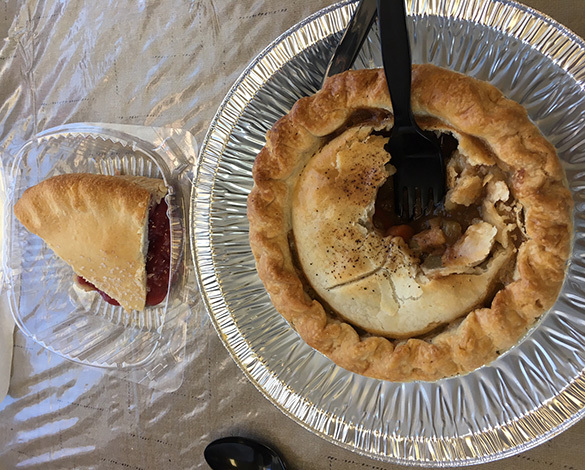 Beef pot pie followed by strawberry-rhubarb pie. Yum! 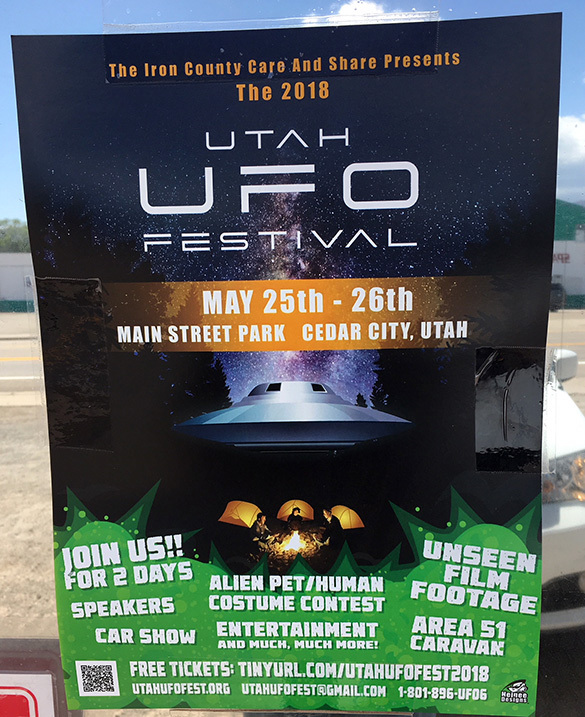 Unfortunately we’re going to miss the Utah UFO Festival this weekend in nearby Cedar City! I so would be going. 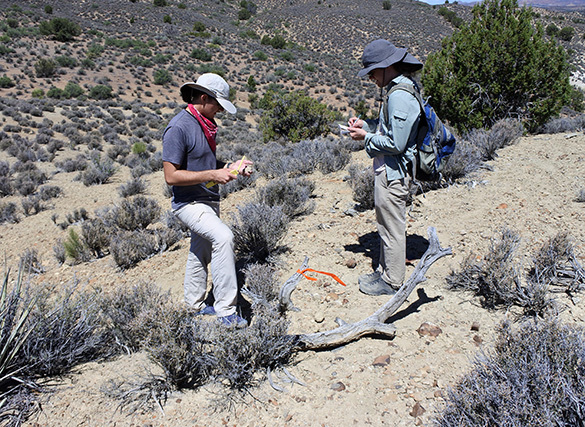 Our very last fieldwork in the afternoon was anticlimactic. We climbed over this huge exposure of Carmel Formation in Dammeron Valley looking for our holy trinity: oyster balls, hardgrounds, encrusted shells. We found none of these. At least it’s one place to scratch off the paleo list. Lots of potential here for sed/strat projects, though. 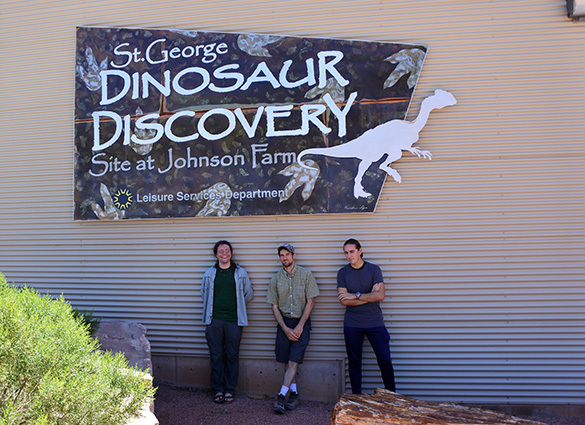 Team Jurassic Utah 2018 is done with fieldwork. Tomorrow will be spent visiting local areas of interest, and then we fly out of Las Vegas on Friday. 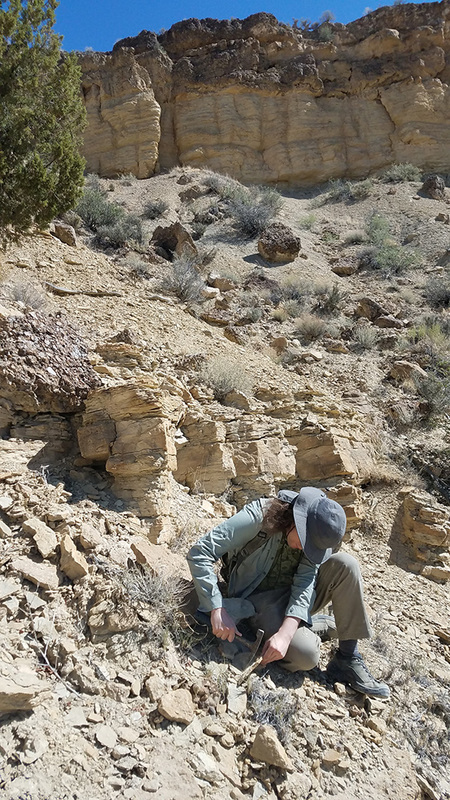 Santa Clara, Utah — Team Jurassic Utah spent the day on Galen Schwartzberg’s Independent Study project, the sclerobionts of the Carmel Formation. 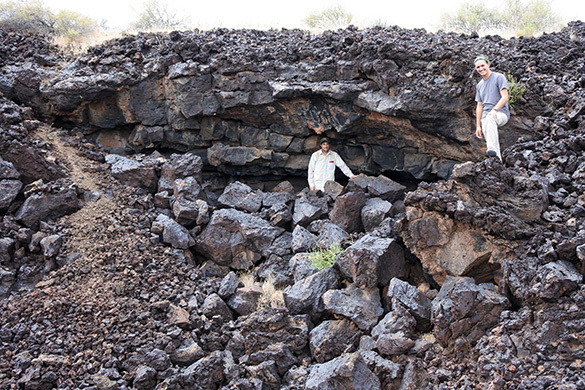 We began with the above carbonate hardground at the appropriately named Hardground West (HW) locality. 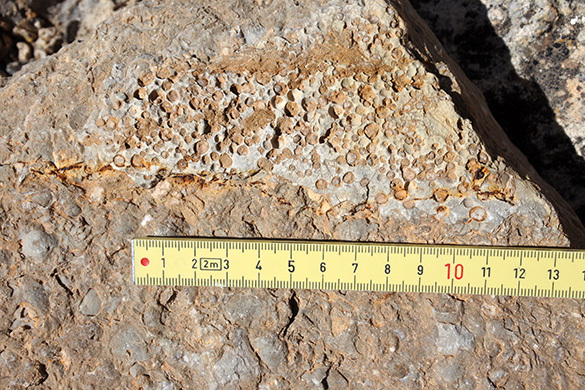 (Just a few meters south of C/W-157 and Ethan Killian’s oyster balls; 14.9 meters stratigraphically below them.) 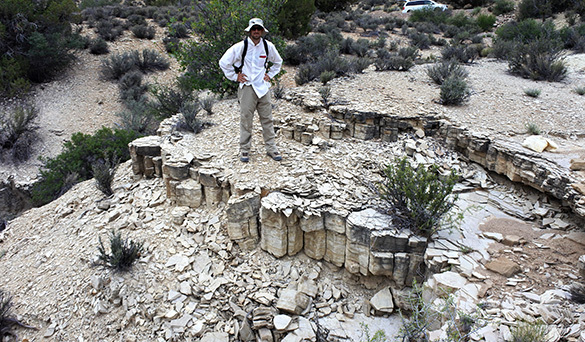 A carbonate hardground is a synsedimentarily-cemented seafloor. 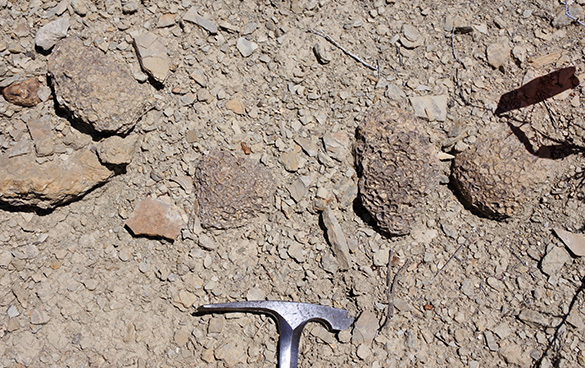 Above the ruler can be seen the top layer of this hardground with many round holes. They are bivalve borings called Gastrochaenolites. 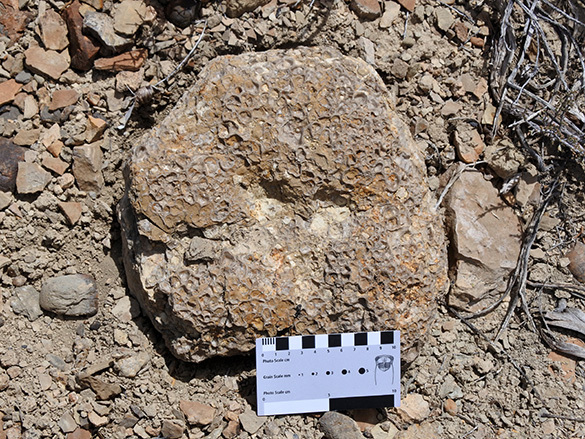 They are what tell us that this was a rocky surface exposed to marine life. 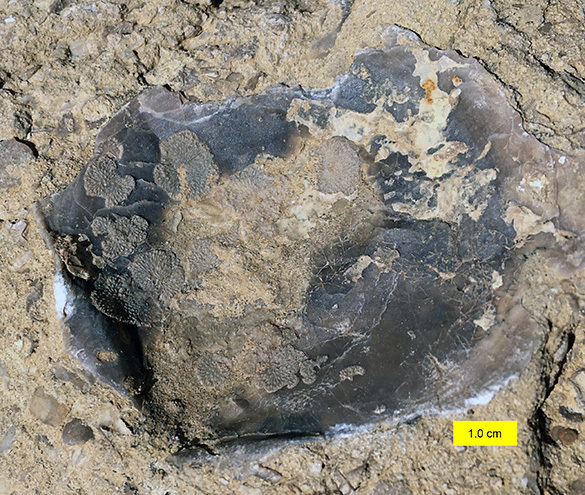 Below the ruler the top layer has been removed, revealing that the limestone beneath is full of internal molds of aragonite-shelled bivalves. The aragonite likely dissolved early in the diagenetic process. Did this aragonite then provide the calcium carbonate to cement the layer above? Maybe, but we haven’t yet come up with a test of this hypothesis. Here Galen is inspecting a hardground. Note that she knows how to protect herself from the relentless sunlight! One of our hardgrounds with truncated borings. There is an interesting cluster pattern here. 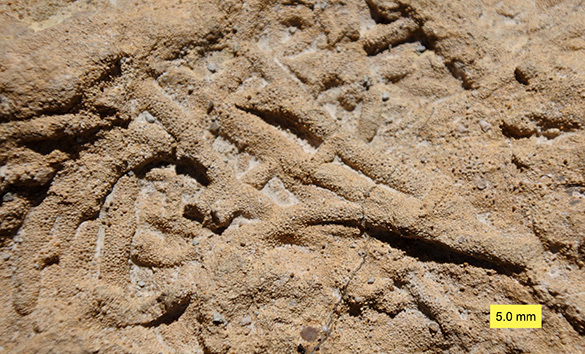 Encrusting organisms that require hard substrates are another identifying feature of hardgrounds. 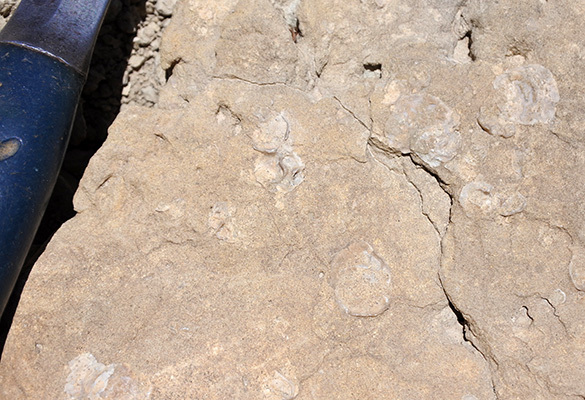 Here our friends the oysters Liostrea strigilecula are attached to a hardground. These are left valves with the right valves removed. At the end of the day we stopped to walk around the remarkably fresh lava flows near where we’re staying in Santa Clara. 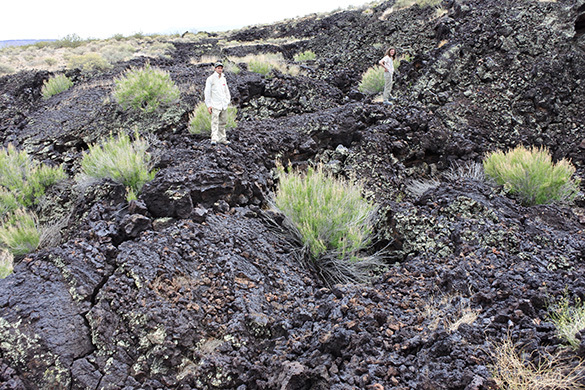 These are part of the large Santa Clara Lava Field, which extends from the north rim of the Grand Canyon in Arizona northwards to Fillmore in central Utah. The flows in this area are as young as 32,000 years old. 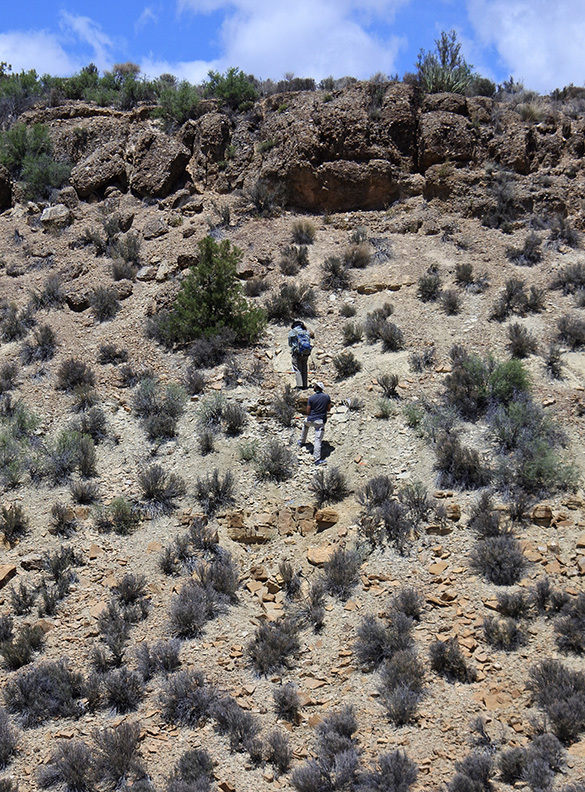 Above Nick and Galen are standing on a pressure ridge. 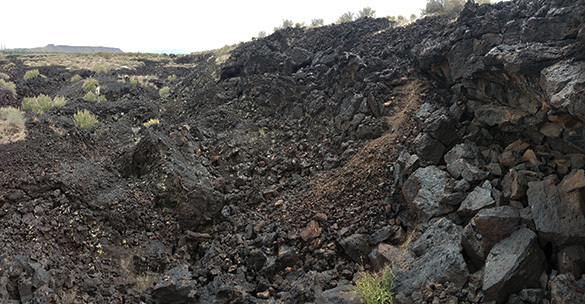 There are numerous large lava tubes in this volcanic field. Nick and Ethan stand near a large one with a collapsed roof. Nick made this image. The flows are very difficult to navigate, so I gained new respect for lava hoppers. 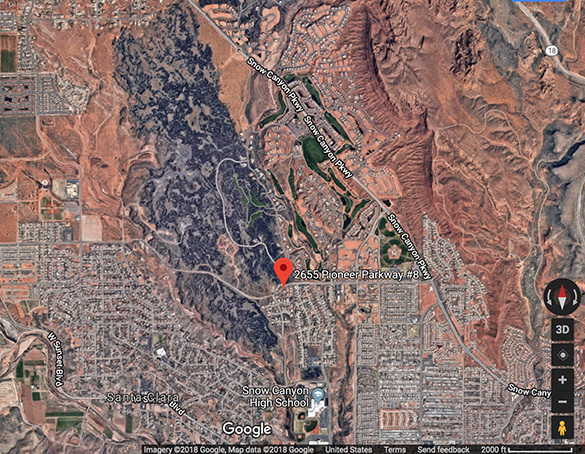 This Google Earth image shows the black lava flows near the Airbnb we are inhabiting (the red pin). 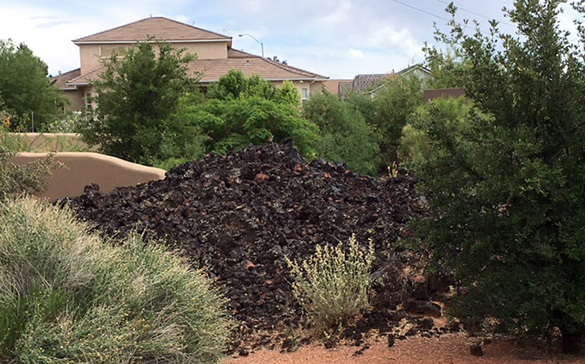 Urban growth of Santa Clara is eating away at the basalt. Our home here is called, in fact, “Lava Falls”. 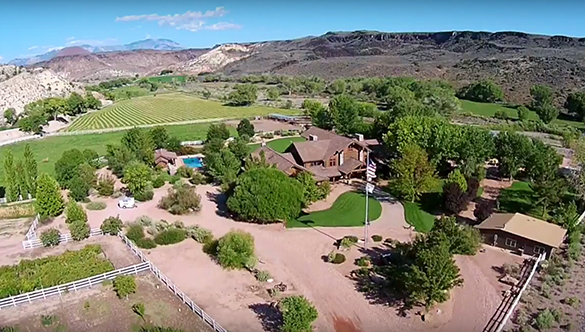 This is a screen capture from the video describing the Eagle Mountain Ranch. Spectacular, and they have Airbnb accommodations! 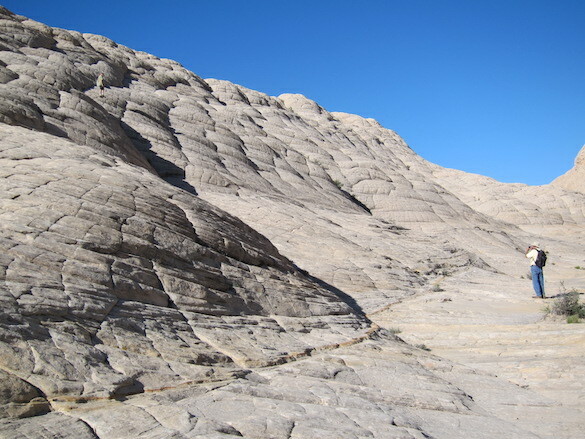 The white rocks in the upper left are Carmel. 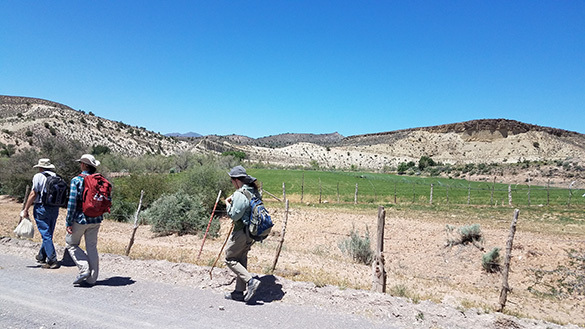 Gail Smith guided us on the ranch roads to reach our outcrops. Very kind of her. 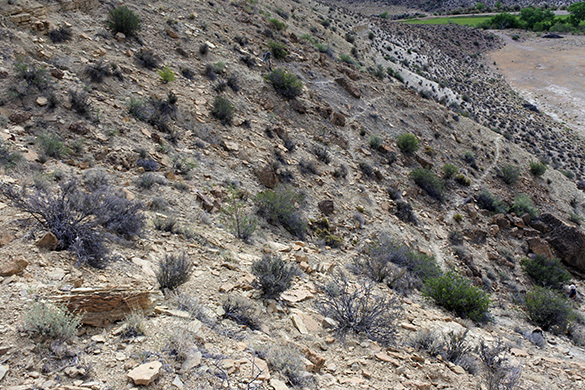 Galen at work chipping away at fossils on Eagle Mountain Ranch Cliff, as we call it. Photo by Nick. 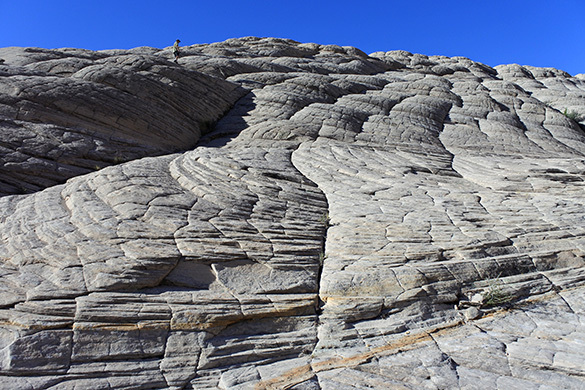 This location has fantastic ooids which weather in slight relief, producing these exquisite bedding plane slabs. 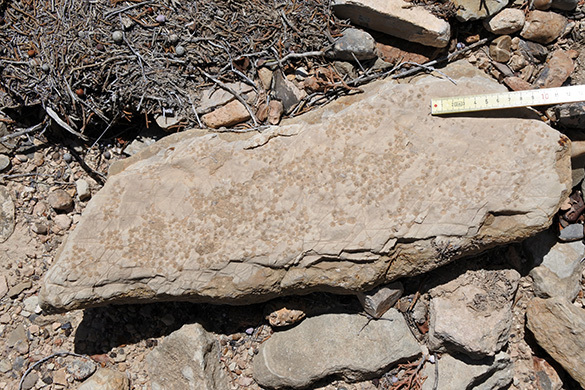 The trace fossils here stand out with their granular surfaces of ooids. This is the bottom of the bed, thus hyporelief. 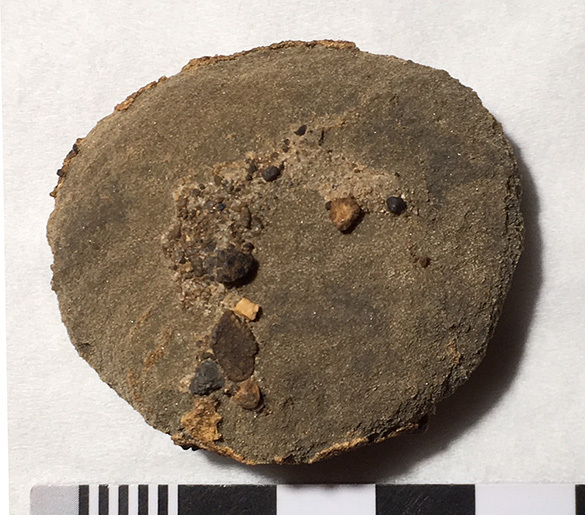 Ethan found this example of Lockeia, a bivalve escape trace, preserved again as convex hyporelief (on the bottom of the bed). 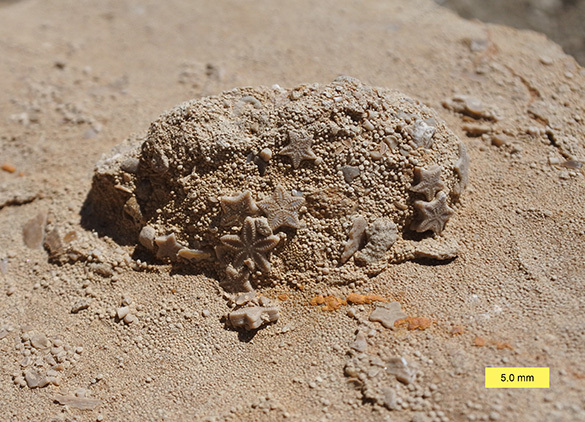 This specimen is cool because it is festooned with the star-shaped colmnals of Isocrinus. 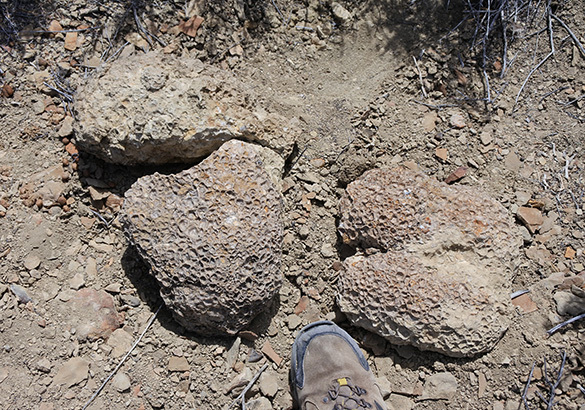 We found this hardground at the Eagle Mountain Ranch Cliff locality. 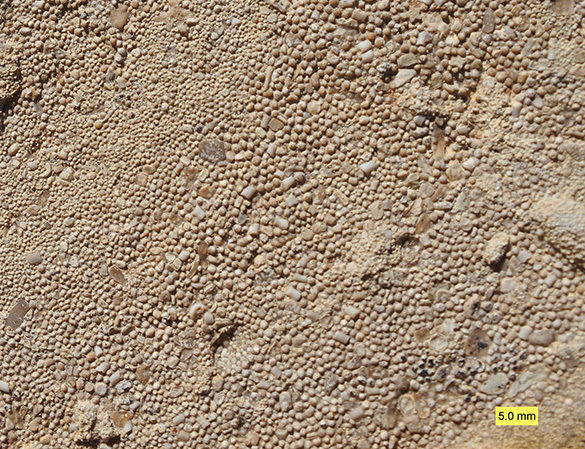 The whitish encrusters are the bivalves Plicatula. 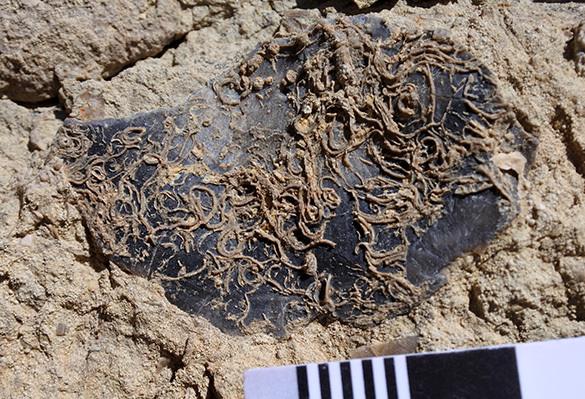 Twisty wormtubes are common on bivalve shell fragments. I don’t think these have been described. 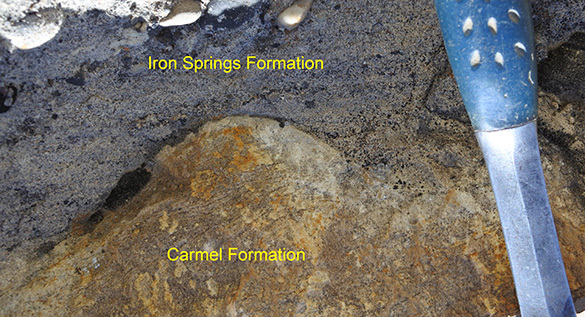 This is one of the few places where the actual contact between the Carmel Formation (Middle Jurassic) and Iron Springs Formation (Late Cretaceous) is visible. 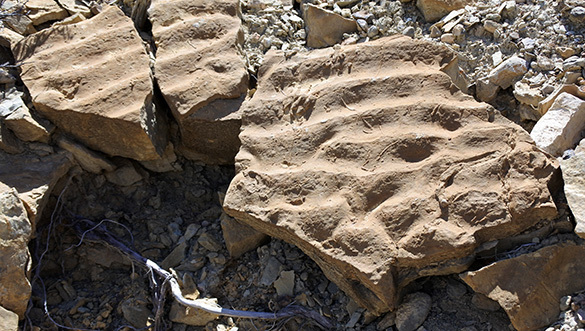 It is a disconformity with a considerable hiatus (interval of time not recorded, up to 100 million years in this case). Tomorrow the students begin their individual projects!